New wave of protest will take place tomorrow Tuesday March one ! 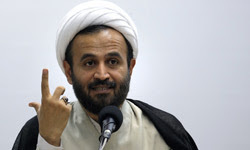 Mr. Mohseni Ejeei the spokesperson for judiciary power in speaking with reporters announced that : "In the first step about the leaders of sedition "Fetneh", we have disconnected their communication as well as visitation and right now their activities are limited and if the situation will allow us, we will take the next step." 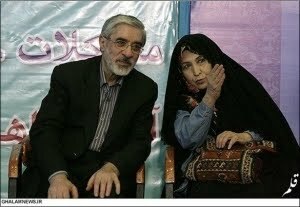 According to news , Mr. Musavi and his wife Zahra Rahnavard and Mr. Karoubi and his wife Fatemeh Karoubi are going to be transfered to Heshmatieh prison in Tehran. Yet another protest and another show of force and oppression by Islamic Republic regime in Iran..
Chanting "Alaho Akbar " night before the protest became a symbol of resistance and preparation of oppressed against oppressors in Iran . Like before, people also chanted in all over Tehran and some other citys. In another news , people were gathered in Vanak Square and protested against the arrest and detension of Musavi ,Karoubi and their wives. Iranian all over the world will also protest in solidarity with Iranian people and green movement leaders. New video From 14 Feb 2011 riot force Shootings at protesters.People in transit speak and protest after hearing shot. Iran has become a big Barracks. "The Coordinating Council for the Green Path of Hope": From now ,every Tusedays of the week, we will go into the streets and protest! The situation in Iran is like unannounced martial law ! There are security and militia forces in every major intersection and squares. "Protest on every Tuesday's" ! Mr. Mojtaba Vahedi the political advisor to Mr. Karoubi ,one of green movement leader announced that; from now every Tuseday we are going to have protest inside Iran till the end of the year ( The Persian new Year on March 20). 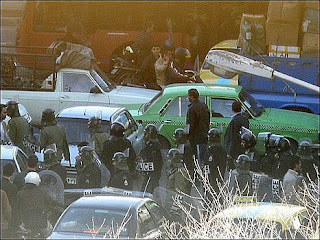 At present , all major squares in Tehran are occupied by security forces and militia on foot or on motorcycles. It seems regime is unable to function and run the country because of all these protests which is escalating to other cities and bringing more people into the protest. 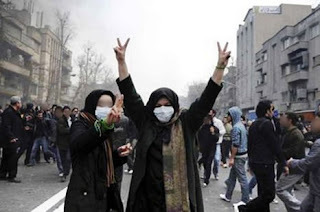 IRAN WATCH CANADA: Again ,people from all walks of life must join the protest inorder to bring this regime down , it seems this isn't the intention of the coordinating council of the green path of hope. government employee,Nurses, transit workers, teachers, doctors and oil workers are needed to make major impact on regime. Ahmadinejad defends human rights in Libya ! People in Iran call him a "Divaneh " or Crazy , i think that says it all ! Democracy and Freedom is what the people of Middle East want ! These are long overdue and new generation want these to happen. Ahmadinejad's advice to colonel Ghadafi :" Respect to the will of your people"!? See,who says what!? He kills the Iranian protesters in the streets in Iran and then prescribe medication for Ghadafi,if you dont call him as lunatic what else you can call him. University of Shiraz in the city of Shiraz is still tense and students are mourning for one of their martyr . According to Daneshjo News more than 80 students have been arrested during protest in Feb.20. 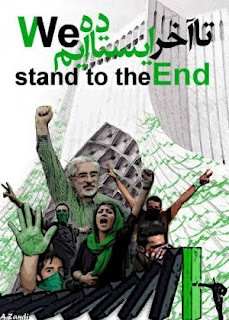 In the meantime there are no news from Mr. Karoubi and Musavi who are under house arrest,however the "Coordinating Council for the Green Path of Hope" released a draft charter of green movement and is trying to find a way to organize more protest in the coming weeks inside Iran. Iran still remain unrest and the Islamic Republic official's nightmare continue ..
Theodorakis State Of Siege,Seige of dictator's palace,Forward for new Middle East,Gradual change,gradual fight for social change-Free middle East ! 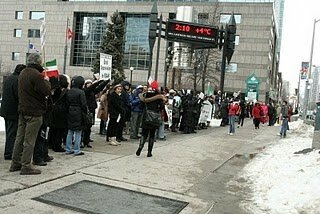 Iranian in toronto-Mel Lastman Square in solidarity w/ Green movement in Iran Feb.20,2011," Death to Dictator" .. 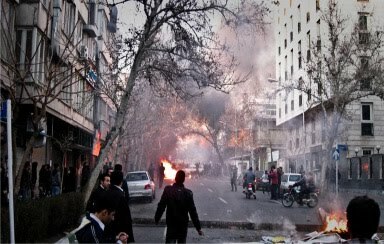 This picture is taken on Feb.20th in one of Tehran street.It looks like war zone, isn't it? Student Organization from major universities in a statement thanked Iranian people for coming out on Feb. 14 and 20th and making all Iran green. In their third communique ,the students plan to come out and protest on Feb.22 and 23rd and they hope the spokesperson /advisor to Musavi and Karoubi ( Mr. Amirarjomand and Mr. Vahedi )in a statement support their actions. On Sunday's Iranian protest another young student was killed by Islamic Republic regime in Iran !Khamenei is responsible for all bloodshed in Iran ! So many beautiful young lives are taken away by Khamenei the dictator and his Islamic Republic regime in Iran! On last sunday's protest by Iranian, another young student of Shiraz University was killed by regime militia. 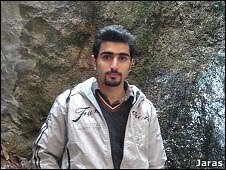 Hamed Nourmohammadi Was student of biology in Shiraz University.He is from the city of Khoramabad and was living in the campus . According to student news Hamed was thrown down from bridge and he was then struck by a passing car and killed. 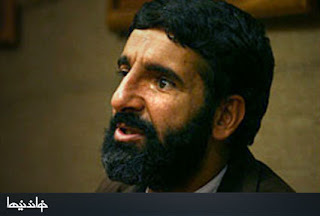 The Fars New Agency (False news agency- a pro-Ahmadinejad news agency) Reported : "Based on Mr. Moazeni the president of the University , Hamed the student of biology was struck by a car and killed and not by security -Militia forces." Security forces have entered into Hamed's campus dorm and took all his belonging with them.According to report the situation of Shiraz University is tense. No one beleives what the regime says . Hundereds of Iranian were arrested Today during the protest in Iran! 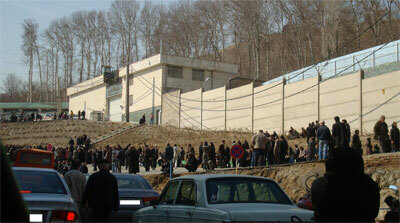 This picture shows families are gathered in Evin prison in Tehran to look for their loved one. Hundereds of Iranian protesters were arrested by security -militia forces and parents or relatives of those arrested ,in search for their childeren or loved one gathered in prisons in Tehran Evin prison and other major cities were protest was held ,according to report more than 50 protesters were arrested just in the city of Shiraz. IRAN WATCH CANADA will bring you the news as it happens in Iran from todays protest commemorating the two young martyrs of Feb.14 protest killed by the regime of the Islamic Republic. 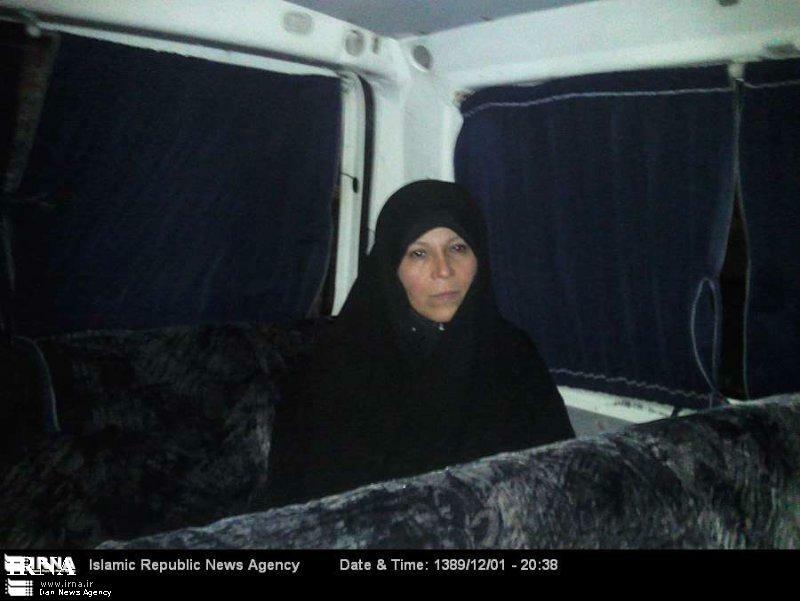 according to Rejanews: Faezeh Hashemi was seen in Valiasr Square among proteters supporting the protesters , she was later arrested close to Fatemi Street. Abdollah Shahbazi a political analyst:We are moving towards bigger crisis.. Still the regime is holding the groung through its forces like Hoseinian , Kochekof (Mr. Mehdi Kochekzadeh- member of Majles -Parliament and pro-Ahmadinejad) and child militia. More split will happen today which can't be repaired later .Up to this point still there are ways to bring the situation back towards a political solution.But what i guess is , if what is happening now to continue to happen in the afternoon and evening ,the little hope that are left will be blown away. 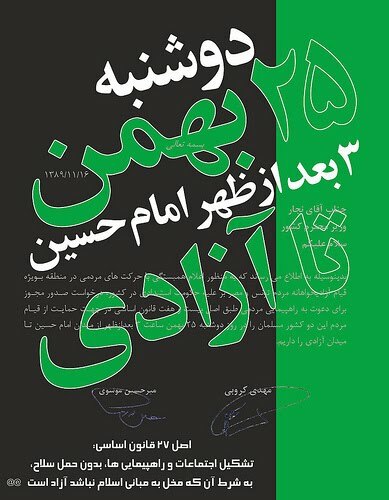 "Coordinating Council of the Green Path of Hope" called people to protest for today Sunday Feb.20 at 3:00pm in solidarity with green movement leaders Mr. Musavi and Mr. Karoubi who are in house arrest and commemorating the 7th days of the recent two martyrs Mohammad Mokhtari and Saneh Jaleh. 3- Clashes are reported between protesters and anti-rioting guards between "Amirabad" -"Keshavarz Bulevard" intersection , protesters are chanting and throwing rocks to defend themselves. 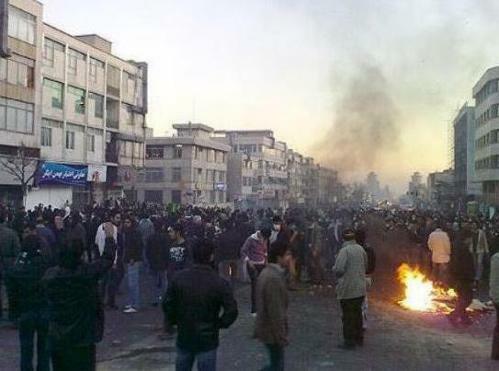 Clashes are reported in Revolution square between Basiji's -plain cloths security forces and protesters . More and more People are joining the protest in Revolution Square in the city of Isfahan and chanting. Seyed Mohammad Reza Khatami, brother of Mohammad Khatami the former reformist president of Islasmic Republic , the deputy speaker of the sixth parliament and former general secretary of the Mosharekat party ,told Mr. Mohammad Sadegh Larijani the head of Judiciary Power that : "you have no competent to be the head of judiciary power any longer". This was told apparently in response to Mr. Larijani after he announced ;the leaders of green movement or " sedition " must be brought to trial. These Reports are all from Iran coming to "Balatarin" by Balatarin members..
1- Anti-rioting guards and security forces are seen in "Pastour" street close to Khamenei's residence . Despite of all the danger the brave Iranian people have gathered in different part of Tehran and other city's in protest against the regime. Mr. Ardeshir Amirarjomand advisor to Musavi and Mr. Seyed Mojtaba Vahedi advisor to Mehdi Karoubi last night asked revolutionary guards ( Sepah Pasdaran) to join people's protest on February 2oth. 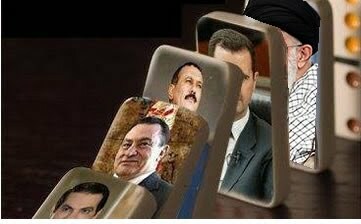 It is in the report that regime has made a steel baricade infront of the Musavis home. So, it seems Musavi and his wife are in house arrest or worse ,no one knows on their whereabout?! In the meantime , people are chanting: If Musavi or Karoubi are arrested, we will all stand up for them against the regime ! Count down,Iranian people are determined to bring this regime down, while officials are preparing to collect more money & get ready to escape ! Mr. Mir Hossein Musavi's advisor Mr. Amir Arjomand : "The march for Feb.20 is certain , people dont pay attention to rumours"! Mr. Musavi's advisor in an interview w/ Resa TV : The Green movement march for Feb.20 will take place in any condition , i ask our beloved people not to pay attention to rumours. 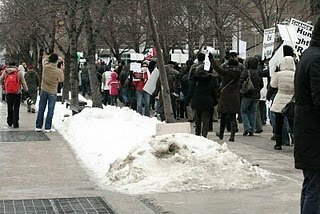 Tomorrow Sunday Feb.20/2011 'The Coordinating Council of the Green Path of Hope" called people for protest against Islamic Republic dictatorship ! On the 7th days of the martyrdome of two young Iranian ! 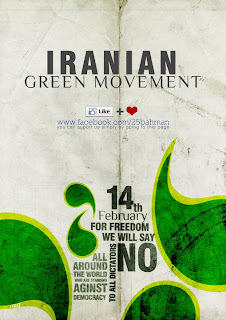 Iranian all over the world will join the protest in solidarity with green movement in Iran. Will join the Sunday protest . The role of these people in the Islamic Republic regime in Iran ! Panahian speaking while others including Rohullah Hosseinian watching during Sane Jaleh funeral processeion. Who is he in the Islamic Republic Regime ? 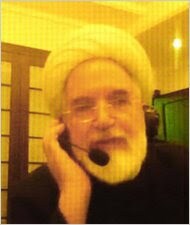 This is Hojatoleslam Alireza Panahian ,he is the founder and president of the "Ammar Quarters". 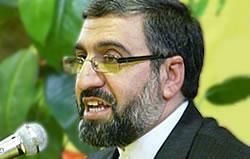 He is the think-tank and representative of Khamenei in universities and a fundamentalist Islamist. Labels: Who is who in the Islamic Republic Regime? Who is he in the Islamic Republic regime? This is Gholamhossein Esmaeili , he is head of the Islamic Republic prisons and deputy to the head of judiciary power ( Mohammad Sadegh Larijani).According to a report by IRNA he announced for the construction of another 47 prison in the Islamic Republic because there are 35 percent increase in prisoners . Focus on Saudi Arabia First and human rights violation there and corrupt Saudi Royal family and the plundering of national wealth in Saudi Arabia. Protesters: We NEED FREEDOM ..... STOP DISCRIMINATION AGAINST WOMEN ! The New generation know if the plundering of national wealth continue their won't be anything left for their childeren. King of Bahrain Offered $2500 for each Bahrainian people to sell their freedom, take it of leave it and we will kill you!? Isn't this an insult to Bahrain people? According to news ,the Saudi soldiers were in Bahrin kiling the people according to eye witnesses many many people have died in Bahrtain uprising. The Coordinating Council of the "Green Path of Hope" in a statement called All Iranian for protest on Sunday February 20 at 3:00pm! Show of Social Networking Power while the leaders whereabout is in question? "The Coordinating Council of the Green Path of Hope" in a statement on the occasion of the 7th day after the death of the martyrs and in support of Green Movement leaders who'se whereabout is in question, called ALL IRANIAN to come out on Sunday February 20th at 3:00pm and protest. IRAN WATCH CANADA: the Coordinating Council of the Green Path of Hope must put its effort to bring the Government employees , Nurses , teachers and transit workers into the street on the coming Sunday Feb.20th for protest ,inorder to become successful the Coordinating council should call them directly in a statement. Statement calling generally ALL PEOPLE won't work ,the statement must call them by their profession/ occupation. Islamic Students organization (Daftare Tahkim Vahdat) announced for one weeks of mourning in all Iran's universities for the two recent martyrs ! "Daftare Tahkim Vahdat " the Islamic Students organization in a communique expressed its condolence to all students and to the families of the two recent martyrs of the Green Movement Mohammad Mokhtari and Saneh Jaleh. the communique also said there is going to be one week of mourning in all over Iran's universities. Regime agents have arrested Saneh's brother Ghaneh Jaleh who bravely made the interview with Voice of America and let all of us know about the government scenario about his brother's situation. Regime stolen the Feb.14 martyrs bodies and buried without parents permision ! 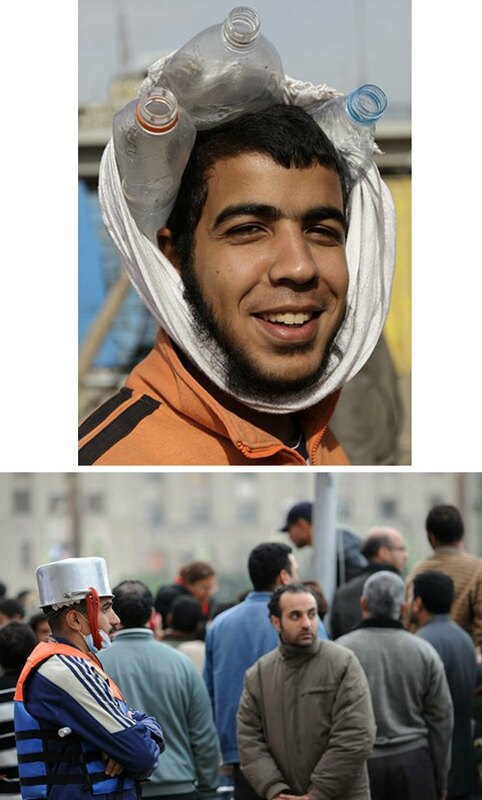 This regime steal martyr bodies from their parents and buries in rush to quickly turn off the issue. Ghane Jaleh :"My brother never was a Basiji , he was a supporter of Musavi." Ghane Jaleh the brother of Sane Jaleh the Kurdish art student of Tehran University , a writer and a green movemet supporter who was killed by the regime militia on Feb.14 peaceful protest in Iran, while crying told to voice of America that: "The Ministry of Information put alot of pressure on my family and made plan to show my brother was a Basiji (Militia ) but this is not true." Ghane added : " 1- Sane wasn't a Basiji 2- My cousine is a known agent of the Ministry of Information , without me knowing about the killing ,he came to our house and asked for his picture and we gave him because he was our cousin ,unfortunately after that he gives the picture to his websites and they annouce him as a Basiji ,I saw that day they fabricated a card for him,they put us under alot of pressure not to speak out ,they dont even give his body to us , we dont know what to do ,if they dont give his body to us ,we won't go to his burial , he always wished like Ghobadi to serve his people ,they steal his body and gave it to the enemy ,we are under alot of pressure , my father says ; dont say anything otherwise they will kill all of us.Yes , this was the cospirecy of my cousin ,took the picture and did this ....."
Ghane spoke about alot of pressure regime put on his family and said: he won't participate in regime engineered plan of burial ceremony for his brother. While crying he said; his father is worried about the rest of the family members, that the regime may come for the rest of the family members. Iranian Students will gather & protest tomorrow at 9:00 am to the killing of an art student ! 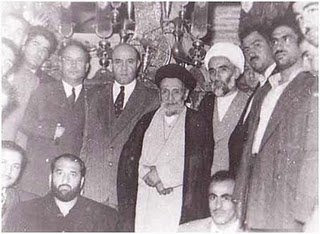 Picture : Shows Saneh Jaleh together w/ other friends visiting Ayatollah Montazeri a long time critic of the regime of Khamenei. Student who came out on Valentines Day for the love of Freedom was killed by regime security agents! The procession will take place at 9:00 am tomorrow in front of Art University. Sane Jaleh was student of art in Tehran University ,he was killed by the regime security forces in the rally on Monday Feb.14. a friend of Sane Jaleh told 'Daneshjoo News" (student news )that, he doesn't belong to "Basiji student organization" (a regime made student organization), he was participating in the protest against the regime.Regime made a scenario and claimed that protesters killed him.By saying that, regime wanted to connect this killing to Mr. Musavi and Karoubi the two leaders of the Green movement. Basiji Students (Students that are militia as well ) with the support and help of regime propaganda machine claimed that; protesters in the green movement killed Sane Jaleh.This regime together with its not elected president Ahmadinejad learned how to tell big lies by reversing the stories 180 degrees. 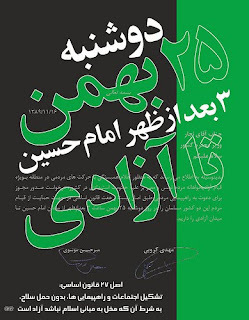 In the past Sane Jaleh the Art student wrote a story called "Otobus " meaning Bus in "Azma" publication, the revolutionary guards publication has written comments about the publication as kind of publication that are activ in "soft war " against the Islamic Republic. The students have said they will participate in the procession and won't allow regime to claime Sane was one of them. 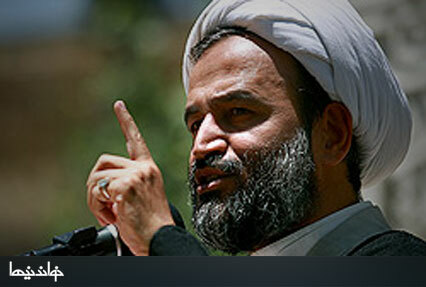 Mehdi Karoubi one of green movement leader: "Remove the cotton from your ears and hear the voice of the people" ! Mehdi Karoubi one of the leader of the green movement and former speaker of the parliament sent strong message to the regime and said:" Remove the cottons from your ears and hear the voice of the people ,Release all political prisoners and remove your hands from the throat of the independent media's and be loyal to promisses you have made through constitution with the people. i'm not afraid of any threat and i'm ready to pay the price." in addition Karoubi said: " Although based on constitution we didn't need the permission for the rally in support of Egyptian and Tunisian people but with good intention we requested permit to hold the rally but instead what we heard was lots of insult and our communication was cut off and we were put under house arrest . Take lesson from those Government distancing themselves from their people. " Protesters chant death to Khamenei, Mubarak-BenAli Its now the time Khamenei to leave Iran! My Tears go for the young Iranian for their bravery and fight back against the regime of Islamic Republic ! Picture: Mohammad Mokhtari ,One of the young Iranian peaceful protester who was killed by regime millitia. Regime security agent also arrested ayatollah Biat Zanjani's childeren . Ayatollah Biat together with Ayatollah Sanei and Ayatollah Musavi Ardebili and ........are suporters of people's rights . Musavi's advisor called for a truth finding committee about the violence during the protest on Monday and the death of two Iranian protesters. Musavi's daughters: "We are worried ,No news about our parents"
Musavi's daughters in a contact w/ Jaras website announced they have no news about their parents. Prior to the march on Feb. 14, Mr. Musavi and Mr. Karoubi were under house arrest and a police van was parked right at the door step of Musavi's home. Regime cut off all communication channel with both Musavi and Karoubi in a way that, even the personal security guards and childeren are unable to speak w/ their parents. It is difficult to see inside the van and no one knows if there are people or they are armed.According to Musavi's childeren , those who have stopped them from entering the house ,diodn't show any identification cards and no one knows who is behind this act. the daughters said: We dont know if our parents are in our home or not/ we are worried what is going on inside this house. We dont know who is responsible for the lives of our parents. 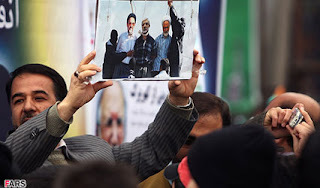 Its been reported that, After current MP's call for the execution of green movement leaders inside the parliament , the head of parliament Mr. Ali Larijani has ordered for the creation of a committee "to review the situation of counter revolutionaries". Really it was painful for those fundamentalist Islamists who had non or very little role in 1978-79 revolution and now have occupied in all levels of the system and who also were through the last year telling the Green movement is dead , yesterday saw otherwise and now in rage calling for the execution of two of green movement leader Mr. Musavi and Karoubi. They are calling for the execution of not an ordinary person but two person who had role in the revolutionary era in 1978-79 and One become prime Minister of Khomei's era and the other became head of the parliament. What is happening behind the scene or behind close door is not known by the majority of Iranian but definitely there are careful planning is going on. These fundamentalist Islamists know very well that execution of these two political fiigure will cause big shock wave in Iranian society and among Iranian in the green movement but despite of knowing this they push for their execution. one of these fundamentalist whos'e hand could be seen in so many political murder is Rohollah Hoseinian( A clergyman) ,he is a member of the parliament , i have no doubt that he is fully and actively behind organizing the members of the parliament to chant for the execution of green movement leaders yesterday inside the parliament.Around 223 conservative (Fundamentalist Islamists )members of the parliament ( No one knows how they have been elected ,perhaps like Ahmadinejad by secret ballot ) called for the execution. 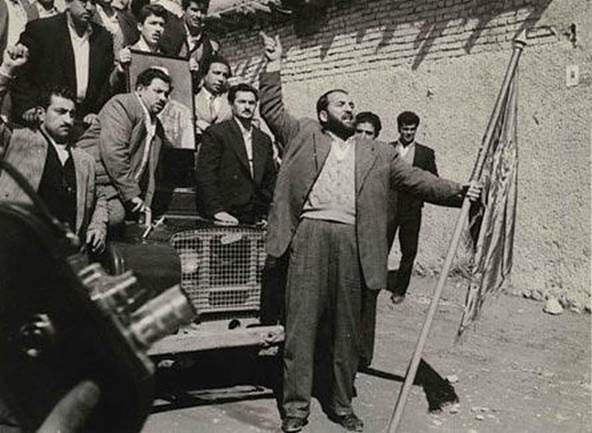 two days ago this picture went on in online web., it shows the henchman puting rope in not only Karoubi and Musavi's neck but also in Khatami the reformist leaders neck. IRAN is going through one of the most dangerous road turn ever in its history in the coming future . MUST SEE - Iran 14 Feb - Basiji forces get ready to attack people in Tehran- This regime support's freedom in egypt but not in Iran ! People prove the regime is wrong about green movement ! Thousands of Iranian people protested on Feb.14 planned rally ! 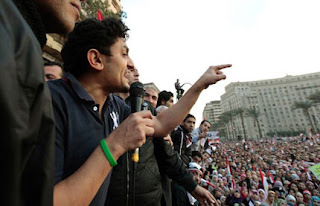 According to report one person was killed , several wounded and more than 250 people were arrested in today's protest . I'm proud of my people in Iran ! Despite of regime's claime,Green Movement came out STRONG ! Regime can't get rid of this movement,it has come to stay till regime is gone ! Congratulation to my dear sisters and brothers in Iran for their brave and couragious protest in Iran today Monday Feb.14,2011 despite of all the police forces ,plain cloths militia's and security agents in the streets and all the arrest they made before and after the protest. Once more you have shown the movement is alive and strong and can come out with or without permision. Regime tried to disrupt all the communication channels , internet and telephone, but failed because, news have reached to its destination and has been reported in major TV stations around the world. 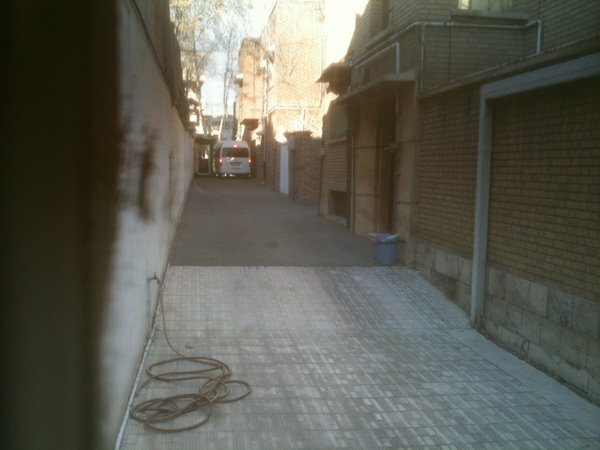 Regime has put both leaders of the green movement and their families (Karoubi-Musavi)under house arrest.And the security agents were in control of their activities.This picture shows police van at the door step of Musavi.It is also reported that, the house of Seyed Mohammad Khatami and Abdollah Nouri was also under the control of security agents. 1-According to report from "Nedaye Sabze Azadi" : While every seconds more people are joining the march , While special guards are watching ,people are marching in the streets in Tehran towards Freedom (Azadi) Square. The first groups of peoples have gathered in Vali-Asr street and are marching towards freedom square. 2-An eye witness told BBC Farsi that, People are chanting "Death to dictator" in "Sadeqieh" square and regime militia's are on motorcycle ready in the scene . 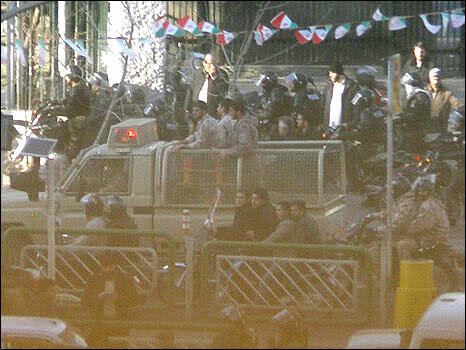 3-First groups of people have gathered in "Imam Hossein " Square at 2:00pm and police forces are present at the scene . 4-Several thousands of people are gathered in "Enqelab " Revolution Square and sorrounding area and are marching towards freedom Square. 5-Students have gathered in front of the university gate. 7- From all over Tehran groups of people in 15-20 are marching towards freedom square. 8- Clashes have been reported between police forces and people in revolution square. 9- Police has closed the roadway to Mr. Musavi's home. 10- In the city of Shiraz , people are gathered in Namazi square and chanting slogan. 1- A young girle have gone on the top of a crane in "Qasr" intersection and hanged a banner with the pictures of those who have been killed last year by the Islamic Republic regime in Iran . She has green scarf in her neck and chanting slogan in support of green movement , lots of people are gasthered in that location.The firemen tried to bring this girle down ,but she threatened she will jump to her death. 1- Mothers who's childeren were killed by the Islamic Republic regime expressed their support for the Feb. 14th protest. 2- Political prisoners in "Gohardasht" prison announced they would go on hunger strike in support for Feb. 14th protest. 3-Ayatollah Sanei: The depotism we are witnessing today is unprecedent in the history . 4-political prisoners from Evin prison sent their support for the protesters on Feb. 14th and said: Our hearts from inside the prison are w/ you . First National Anthem of Iran - "Vatanam "
Count Down: 8-9 hours left to major nationwide protest rally in Iran against "Dictatorship" ! 1-Count down- Protest may start earlier as planned, it may start either 12 noon or 3/4 pm.Still we have 5-8 hours to that. Time now in Iran is 7 am . 4- Since Thursday ,Mehdi karoubi's communication w/ outside his residence were cut off. Mohsen Yeganeh Concert, Malaysia Kuala Lumpur "death to dictator"
We dont need permission to hold protest, Based on Article NO. 27 we are allowed to hold rally told Mr. Ardeshir Amir Arjomand advisor to Musavi ! Mir Hossein Musavi and Mehdi Karoubi are going to participate in the rally tomorrow! "Mr. Ardeshir Amir Arjomand advisor to Mr. Musavi told BBC Farsi that, if we informed officials about our rally, was because, to let them to prepare security for the rally. " "Based on constitution We dont nee permision to hold rally" said spokesperson for "Etemade Melli " political party. "300 Tuman for a piece of bread , damn to leader's state" is one of the slogan. Regime is scared from tomorrow's protetst , warned government employees in all over country to go to work and not to join the protetst. Death to dictator ! "Alah O Akbar " , Iranian started their anti-dictatorship protest ! 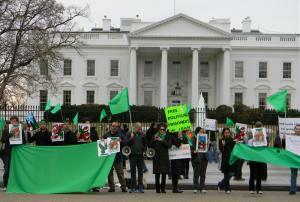 A group of Iranian in front of White House protest in support of planned rally in Iran Feb.14/2011 ! BEST GIFT FOR IRANINA PEOPLE ON VALENTINES DAY IS FREEDOM ! A NATIONWIDE DAY OF PROTEST IN IRAN as reported! 1-Tonight the "Alah O Akbar" chanting will remain in the history. Our protest is peaceful but if they attack us it will be different story. ITS NOTHING,JUST TEARs FOR FREEDOM, Why Can't we have freedom in Iran? ! 1. As part of the interior ministry’s responsibility to uphold its legal obligations and the people’s legal rights guaranteed in article 27 of the constitution, this ministry has a duty to issue a license for demonstrations in support of the people’s movements in Tunisia and Egypt in response to the request made by Messrs. Mousavi and Karroubi. Furthermore, this ministry must immediately inform the public of all measures taken to ensure the safety of citizens and the peaceful holding of the demonstrations. Failure to respond to this request and to take the necessary measures to hold the demonstrations peacefully will disgrace the government of Iran on national and international levels and will basically undermine its official stance in supporting the people’s movements of Tunisia and Egypt. 2. 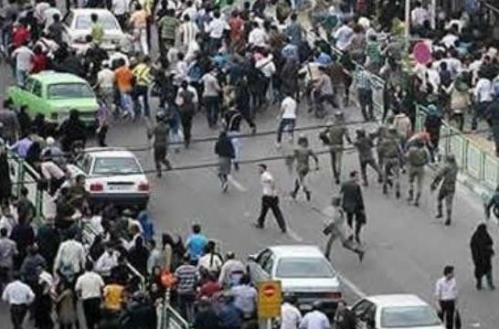 The noble people of Iran and followers of the green movement should participate in this peaceful demonstration with calm and resolve, and must not allow the infiltrating agents of those seeking violence to derail the demonstrations with their aggressive behavior under any circumstances. 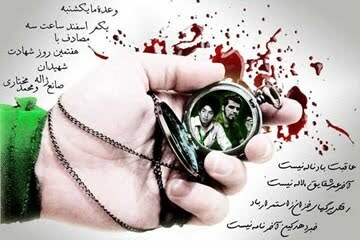 Our promise, we meet on Monday February 14, 2011, 3:00pm in Tehran from Imam Hossein Square to Azadi Square. The Most Vicious and Scary Officials in the Islamic Republic regime in Iran ! Who are these people in the Islamic Republic Regime in Iran? The Most Vicious and Scary officials in the Islamic Republic regime ! 4-Hamid Rasaei (Clergy)- Member of the parliament and manager of the "Nohe Dei Weekly"
12-Haj Hossein Yekta- Former secretary of "Rahian Noor "
13-Ali Samari(clergy) - Secretary of the central committee of " Selection " for all over the country. In this assembley , there are 70 well known supporter who are active in cultural and propaganda machine of the regime. 15 members of the centarl council of this organization,each have many anti-democratic /freedom in their report cards. More than 500 graduate students from"Sanati Sharif "University protested the death sentence of Mr. Said Malekpour the Iranian-Canadian professional ! Mohammad Sadegh Larijani the head of judiciary power himself will be responsible for the negligence in justice for Said Malek pour ! According to online news , more than 500 graduate of "Sanati Sharif " University students and Many others in a letter protested to the death sentence of Said Malekpour a graduate of the same University. While condemning the illegal and inhuman behaviour against Said ,The signatories also called the charges against said as baseless, which are taken under torture , long term solitary confinement and pressure for baseless video confession. The signatories are , graduate students of " Sanati Sharif " University, Well known University professors from all over the world , professionals and winners of the world Olympiad . The signatories demanded the execution in Iran be stopped and regime to follow the human rights . Wael Ghonim w/ green bracelet,a symbol of green movement in Iran. Iranian,Egyptian,Jordanian,tunisian, in general Middle Eastern and Arab youth want change ,freedom and democracy for their region and people. They have focused on their region for change, why not?!. They can see how people in the other part of the world live particularly the European and North American and they compare for example the lives of people specially women in Saudi Arabia and other countries in the region and see the differences. Time has changed , old generation is giving their place to younger one and this change will make big impact and difference in the world particularly in the Middle East. Time is running definitely against dictators and dictatorship. Time to let younger genration to participate in politics. "This movement in Egypt is similar to green movement in Iran and not of Islamic Republic, the reason why because the protesters dont carry pictures of Khamenei or Ahmadinejad or any of the current officials in Iran." 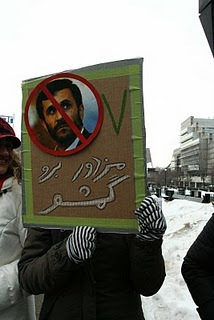 Iran Watch Canada: Now Look what the Islamic regime of Khamenei-Ahmadinejad does to its own people !? For the Iranian opposition, events in Cairo mirror the post-election protest movement in Iran in 2009, not the 1979 Islamic Revolution, and could give new life to the Green movement for political reform, which Mr. Karroubi said had largely been battered into submission by government oppression. “If they are not going to allow their own people to protest, it goes against everything they are saying, and all they are doing to welcome the protests in Egypt is fake,“ Mr. Karroubi said. Mr. Karroubi, while conceding that public activism had faded in the face of a harsh crackdown, said the Greens were still working for the kinds of basic rights they have always sought: free elections, freedom of assembly and freedom of speech. The movement has tried to highlight the incongruity between the Iranian government’s oppression at home and the fact that it welcomes political protests elsewhere. Mr. Karroubi said he was living under near house arrest, with two or three cars full of guards outside his house for most of the day, turning many visitors away. He had not talked with a foreign journalist in about six months, he said, although he has occasionally answered questions via e-mail. For the video interview, he wrapped a headset around the back of his neck because it would not fit over his white turban. 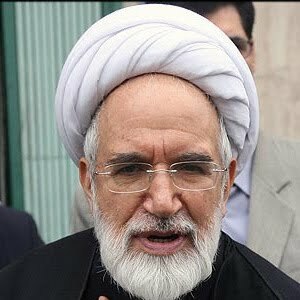 Mr. Karroubi said he was able to plan the call for a protest with Mr. Moussavi because the two had met recently at a wake, but otherwise they have had limited contact. They have not decided yet whether a march through downtown Tehran should be silent, he said. Should the young Egyptian protesters succeed in fomenting change, that would bring added pressure on the Iranian government, Mr. Karroubi said. It would mean that both Turkey and Egypt, the most populous states in the region, are more democratic than Iran. “It will show that Iran has been left behind, that it has not gone forward with the principles of the revolution that everything should be based on the vote of the people,” he said. Still, he noted that while a failure of Arab protests would be a setback for the Greens, the reform movement would still continue. Artin Afkhami contributed reporting from Washington. A version of this article appeared in print on February 9, 2011, on page A14 of the New York edition. Islamic Regime in Iran has again started arresting the organizers before the rally begin in February 14! Regime and its officials like Khamenei -Ahmadinejad can say so manythings about other countries people's freedom but when it comes to its own country they become hypocrite. khamenei in last friday prayer and other regime officials have spoke so many things about people uprising in Egypt ,.Tunisia and other countries and their support for those people but when last week Iranian people announced they are going to have rally on Feb.14 in support of egyptian-tunisian people ,regime has already started arresting organizers and activists. Today i have red that , regime agents have arrested Taghi Rahmani a" Meli-Mazhabi " and a religious schoular. 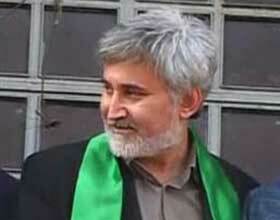 Mr. Rahmani was an advisor to Mr. Karoubi one of green movement leader. Mr. Rahmani has spent 2/3 rd of his life in regime jail. "Their request to hold a rally on Feb.14 in support of Egyptian -Tunesian people is divisive, instead they must participate in regime rally which is organized on Feb.11 on the anniversary of revolution". Mr. Hossein Hamedani commander of "Mohammad Rasoulolah " headquarter told reporters that ;"Any actions by opposition will be strongly dealt with". Ayatollah Mohammad Sadegh Larijani the head of Judiciary power: "If we arrest the leaders of Fetneh ( Sedition ) or leaders of green movement ,they will become saint ." In the meantime, support and participation list for Feb.14 rally is getting longer and bigger , based on the news online on Feb. 14 there is going to be rally almost all over Iran. Count down- 7 Days to the rally of green movement supporters in Iran from Imam Hosein Square to Azadi Square ! Count Down 7 days to the millions march in Iran is solidarity with Egyptian, Tunisian ,Arab people against dictatorship and for freedom ! poster released by green movement calls for rally in support of Egyptian,Tunisian and Arab people uprising against dictatorship and for freedom! 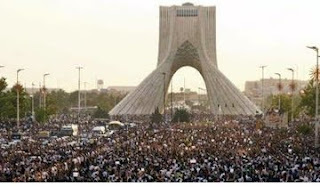 Rally in Iran : February 14,2011 at 3:00 pm from Imam Hosein Square to Freedom Square. Look how Mubarak' army respond to a peaceful protester.Same happened in Iran a year ago against peaceful protesters. film has Graphic violence scene.. This film is very graphic and vilonce. start at 3:00pm from "Imam Hossein" Square to "Azadi" (Freedom )Square . The young Iranian are preparing themselves for this day. The young Iranian announced they will start their activities from the night of Feb.13 by chanting "Alah o Akbar on roof top of buildings .There are a lot of activities going on in online news media. 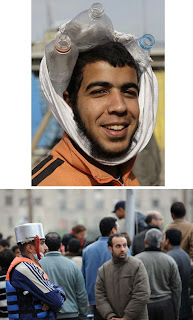 Egyptian freedom fighters protect their heads from rocks and batons Feb.2011 ! 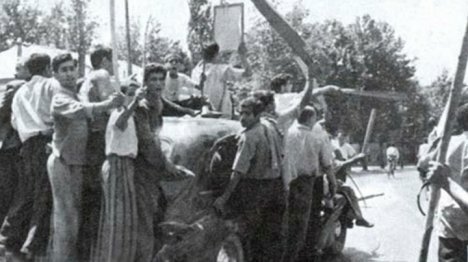 1953 coup & behind the scene politics-tactics,using mobs,clergies &military personnels to overthrow national democratic Govn't of Mossadeq ! 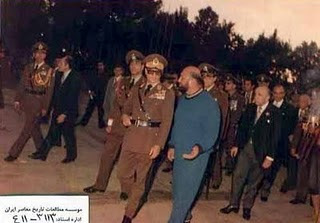 Pictures show how the coup organizers behind the scene were able to organize pro-regime of Shah scenario to overthrow the national democratic Government of Doctor Mohammad Mossadeq in Iran who said NO to British petrolium and despite of all the tricks and treats went on to nationalize the Iranian oil industry.When doctor Mossadeq's Government controlled the country and shah fled Iran,and after all other option failed then coup become the only last option for the Shah and his foreign supporters like British government and US/CIA.They organized mobs like Tayeb brothers,Shaban Jafari (bimokh-no brain) ,high ranking religious Ayatollah like Kashani and high ranking military officers in Mossadegh government like Ardeshir Zahedi.....armed with knives ,Machette's , sticks,guns and power were able to make enough noise to topple the only democratic government of Middle East in 1953. 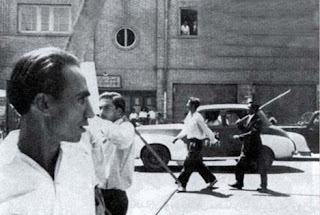 The picture shows Shaban Jafari in front of the mobs in protest against Doctor Mossadeq and in another picture with Shah and Ayatollah Kashani after the coup .